MOSCOW, April 9. /TASS/. 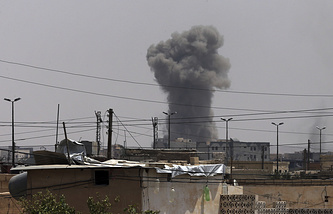 Terrorists from the Islamic State (IS, terror group, outlawed in Russia) attacked on Monday the positions of Syrian government forces in the Syrian Desert after a missile strike against the T-4 military airfield in the Homs province. According to the Al-Mayadeen TV channel, the attack was thwarted in the Sebaa-Biar area. There are no reports on casualties among military servicemen. The TV channel earlier reported that Israeli warplanes were carrying out reconnaissance flights in the border area between Syria and Lebanon when a missile strike against the Syrian military airfield was delivered. SANA’s report earlier said that the strike against the airfield had presumably been delivered by the US Armed Forces. Meanwhile, both the White House and the Pentagon declined to confirm that the US was involved in the attack.